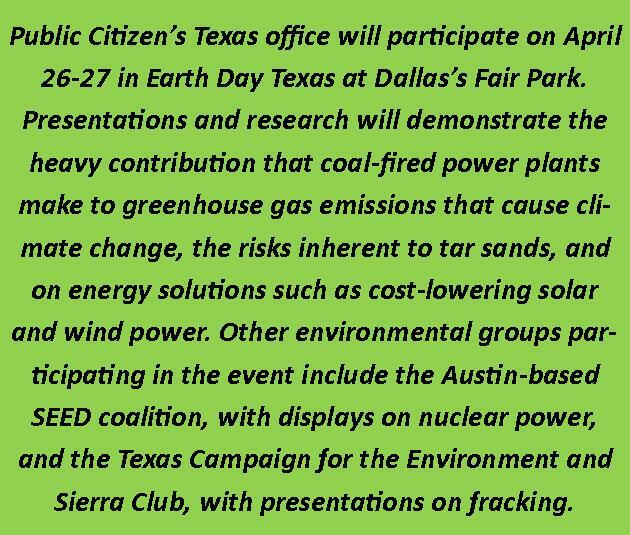 As Earth Day approaches, Texas environmental groups are urging state leaders to jump at a rare chance to lead the nation in using renewable energy technologies that U.N. climate scientists say are increasingly inexpensive antidotes to climate change. Smith quoted a recent Citigroup analysis, which said that solar, wind and other renewable energy sources are becoming cost-competitive as gas prices remain high and volatile. The report also predicted that renewables will continue to gain market share from nuclear and coal power. Last week, the International Panel on Climate Change, the U.N. panel of hundreds of climate scientists, issued its fifth and most dire report, warning that greenhouse gas emissions are rising faster than ever. The report said that only concerted action to bring down emissions in the next 15 years will keep global warming to the level the international community has agreed to – an average 3.6 degrees above preindustrial temperatures. Texas’s wind farms already have generated as much as 38 percent of the electrical power on the ERCOT grid, according to a recent media report. That reflects the highest power output by wind turbines in the country. Although Texas is rich in solar resources, it lags behind other states in solar-generated power, in part because the state legislature has not supplied the kind of incentives provided to the fossil fuel industry. Texas ranks 13th in the nation for the amount of power generated by solar, according to the Solar Energy Industries Association (http://www.seia.org/state-solar-policy/texas). Austin Energy, though, just agreed to what the Austin-American Statesman described as one of the largest solar projects in the world, which will more than double the solar capacity in Austin. The article pointed out that Austin Energy’s contract with Sun Edison is inexpensive – about 4.8 cents per kilowatt-hour for electricity coming from two West Texas sites. Texas is the No. 1 contributor of greenhouse gases in the nation. 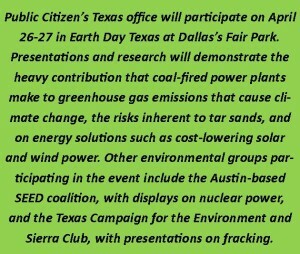 Texas emitted nearly 450 million metric tons of carbon dioxide in 2012, according to the most recent EPA statistics. The next highest contributor, Indiana, generated about 150 million metric tons in 2012. Earlier this year, Texas Gov. Rick Perry also proposed that Texas agree to take high-level radioactive waste from the Los Alamos national Laboratory in New Mexico.